So we enter the 1990s on my list of hard rock favorites and it’s a good ‘un! Let me begin with this… Rob Zombie is a twisted and talented genius. And yet I haven’t watched a single one of his films that caused me to walk away saying “That was great!” That’s because they’re just not even the slightest bit entertaining for me. I first discovered White Zombie while working at Peaches Music & Video on the old High Point Road in Greensboro. A coworker was digging the 1989 album ‘Make Them Die Slowly’. I borrowed it for a listen and thought it was okay enough to purchase. It was a little sludgy and punkish. But I liked it. As I have gotten older, my “like” for the album has dramatically waned. But when I heard their major label debut ‘La Sexorcisto: Devil Music Volume 1’ I was Zombie for life. They were incorporating audio from movies and television. That was something that I was doing with my mix tapes. White Zombie churned out incredible riffs and they had the kind of groove that made you feel as if you could watch sleazy strippers gyrate and twist all night long. 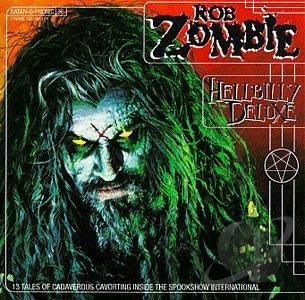 But for my money, Rob Zombie didn’t quite hit his stride until he ditched the “White” and released his first solo album ‘Hellbelly Deluxe’. Rob Zombie, for me at least, was an Alice Cooper for a new generation. The horror imagery was neck-high and his voice had the same type of gravely character. And the shows! Zombie shows are a sight to behold. The only “negative” thing that I can say about Zombie’s music is… I have to read the lyrics most of the time in order to understand them. His delivery along with the vocals buried in the mix doesn’t allow me to hear them clearly. But I get it… Zombie’s voice is just another instrument in the mix so it doesn’t necessarily have to be front and center. The standouts on this album include “Living Dead Girl”, “Dragula”, and “Superbeast”. But there are other dark little gems on this album… like “The Return of the Phantom Stranger” that sounds as if that stranger is dragging a foot while trying to catch you. There’s the industrial grind in the rest of the songs like “Demonoid Phenomenon” and “Meet The Creeper” that makes dancing to these songs a possibility. “Demonoid Phenomenon” comes with some riffs that would make Tony Iommi proud. The production is fantastic and the mixing begs you to put on the headphones or squeeze the ear buds in. Throw in some entertaining short tracks to “horrifically” fill the segue selections on the album and boom! You’ve got one of the great hard rock albums of the 1990s. It's just another fun and jamming album. There's nothing to really dissect with a high-brow knife. Just turn on, tune out, and enjoy. Check out the other two perspectives of this album with Tim Beeman and Jon Lowder. Let's see if we're all in agreement or not. I find reading the other perspectives quite fun!